The 1893-S Morgan Silver Dollar is the Granddaddy of Business Strike Morgan Dollars. By 1893, the US was engulfed in a severe economic depression. The Sherman Silver Purchase Act of 1890 required the US government to purchase 4.5 million ounces of silver bullion monthly, but unexpectedly resulted in the depletion of federal gold reserves, pushing the nation to the brink of bankruptcy. The massive influx of silver into the Treasury Department led to the coining of millions of unneeded silver dollars, most of which were stockpiled in federal vaults. Soon after taking office in March 1893, President Grover Cleveland successfully pushed for the repeal of the Sherman Act. Morgan Silver Dollar production plunged dramatically, down 77% from the previous year, and down 96% from 1890, the first year of the Sherman Act. Against this ominous backdrop, only 100,000 silver dollars were struck at the San Francisco Mint in 1893, leaving few examples for collectors of today to scramble for. The 1893-S is the granddaddy of all business strike Morgan dollars in terms of rarity and desirability. Few US coins can match the impressive rise in value and consistency of the 1893-S Morgan Silver Dollar. As one might expect of one of the most important key dates in one of the most popular coin collector series, the Morgan Silver Dollar, the 1893-S has consistently shown amazing price increase consistency. 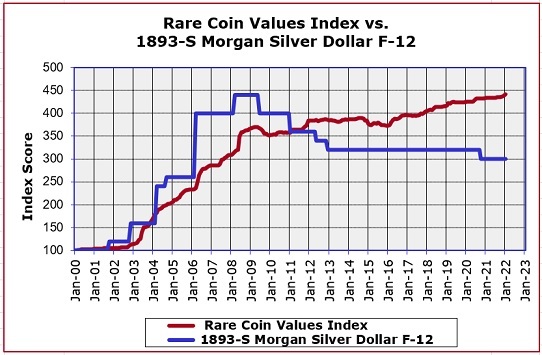 Using Year 2000 as a baseline, the 1893-S Morgan Silver Dollar has multiplied in value many times, as charted by the blue line above. The red line charts the progress of the Rare Coin Values Index, which is composite percent change of a pre-selected group of 87 rare US coins. The Index baseline is year 2000 likewise. The objective of the Index is to follow the direction of the overall rare US coin market. The 1893-S Morgan Silver Dollar is one of the 87 coins that comprise the Index. Every month, the Index chart is updated.